This entry was posted in All Posts News Politics and-or Videos, Elections, England-UK-Britain, Politics, Reform, Revolution, Socialism and tagged Jeremy Corbyn, Labour Party, William Bowles. Bookmark the permalink. All these ‘experts’ coming out from under the woodwork. Annoying, to say the least. Even Rome wasn’t built in one day…for crying out loud, give the guy a chance. The writer of this article…could he do better? Has he attempted? The contrast with the deadlock and endless prevarication on the part of European politicians could not be greater. “We should trust the citizenry to act according to their own lights” suggests David. Real food for thought, thank you Marianne. This is not a time for frail hearts…as if there ever was such a time! Thanks everyone for your comments. Great discussion. I agree whole heartedly. Three points strike me as acutely relevant ~ the issue of reclaiming a free press; the criminal hypocrisy of British support for murderous Saudi fascists and their kindred alliances; and the fundamental issue of “labour” ~ the plight and rights of workers generally. I’d like to add a brief “coda” to that question, as it is so central to all progressive, radical and revolutionary discourse. We all work, except those who have inherited privilege and wealth of course. Altho’ it does not necessarily follow. Anyone can choose their path in life who has the freedom to choose. It is all those not enjoying that basic right who most need our support and solidarity. My complaint is that politicians are not the ones best placed to address this perennial question. It is innovative entrepreneurs, Silicone Valley systems analysts and ecologists who have the potential solutions and forward thinking ideas we need to debate. So I would say that the real deal these days is access to that information, that reverts back to the freedom of the press & methods of education ~ all of which are profoundly inflected by the expansion & openness of the Internet. What politicians can do, is fight for that openness, and flatly refuse to patronise oppressive regimes. In fact we should demand our representatives divest and sanction criminal governments in ways that affect those in power rather than punish the populace. How people organize and how they operate their community transactions is a job for local banks and individual initiative, leadership. How institutions of governance and business function ethically is the task of international law. I think we must totally reconfigure our notions of due process and “duty of care” to reflect the needs of this evolving contemporary society, in a globally connected and dynamically emergent, interactive reality. Corporate industry must be restricted in its activities, regulated robustly and fairly (ie ecologically) and all public servants held fully accountable. Until we stop corruption in its tracks, jam the revolving door, break the glass ceiling for good & get our biosphere politics sorted out and our aim straight, I see no likelihood of improving the lot of humanity generally. The most revolutionary act is to think for oneself ~ and then to share those ideas & experiences, intelligently and coherently. 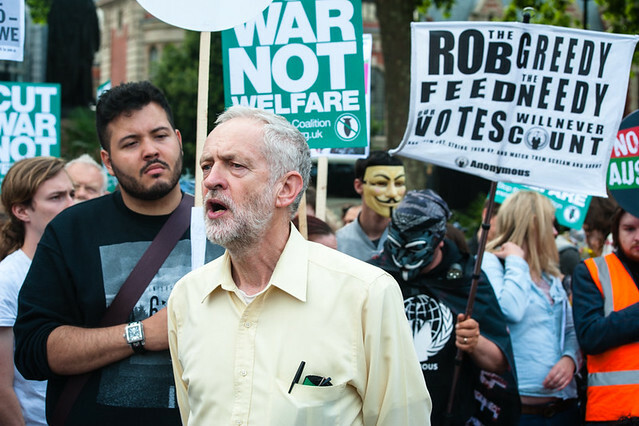 The key to Corbyn’s progress is galvanising the British people to take an interest in their own welfare. It was William Hague who required the dismissal of democratic accountability by him and his mates in ordering petitions to the representatives to have one hundred thousand signatures before he or they would consider them. He used to be amusing but has long passed his sell-by date. Under these new Hague Rules democracy is suppressed and the people must support the few grassroots organisationas that have sprung up to confront the tendency to fascism – Avaaz, Positive Money, Unlock Democracy. This is how we provide daily evidence that Corbyn has our support until we are again enabled by a free press to know the issues and personally give our opinions. From a marxian perspective talk about Corbyn’s making revolution is absurd. What’s missing from the conversation is a question of what Corbyn’s political victory means for the real makers of revolution, those with the real power to throw a wrench into the gears of capital — those who produce the surplus wealth that capitalism is absolutely addicted to and depends on for its continued existence — that is the class of exploited workers. Focus on this question is much more meaningful and will bring us closer to the first step in replacing capitalism with socialism. Just as I thought we are now in the dark ages a light appears, Corbyn, why is their 7% labor for this man? is as you know the labor party is just a extension of the Conservatives? the cowardice of the two main parties revealed. Always the enlightened have a problem with the lower classes? have they been so inbred to think in a way often called programmed who no longer have a moral aptitude to of a description of aspiration I had to go back to Davids commentary to say it the word noblest of aspirations? in this world always a danger to speak words as such, as being idealist you must not be idealistic? so what are we to be realistic? what is realistic? the killing of hundreds of thousands in the Middle East? the supply of militaristic equipment to Saudi Arabia for a despot government a country notable for human abuse, no less than a billion dollar industry for Britain? is this what the herd wants as a voting public? nevertheless we have a duty to the herd to attempt to enlighten that they have been programmed with centuries of propaganda, by the controlling elite and this is where we must give credit to our enemy within that is to control and manipulate the masses mind for so long is a admirable feat to accomplish, the fact that leaders such as Cameron, Blair and so on can manipulate so many against their better judgement is amazing and what is even more amazing is some one such as Corbyn should become a light for so many who only deserve slavery rather than a man of outstanding character. Indeed as the commentaries seem to indicate, both here and all over the place, we are in for a rocky ride. How should one translate principle into pragmatic policy? I’m inclined to suggest we need to shift the emphasis away from party and partisan carousels or committee deadlock, back to the responsibility of the individual to demonstrate the necessary backbone to make it all meaningful, an ethical exercise of pure intent. In other words, we should trust the citizenry to act according to their own lights, and desist from the follow-my-leader reflex that seeks salvation in personality and presence. That is a trick of the media to perpetuate and pursue profligate irrelevance in public life. Politicians are public servants. It is up to the public to stand for something worth serving. Those who cannot lead will follow, and those who cannot stand alone, willing to risk contempt in defiance of the herd mentality, should strive to serve or be willing to do so should they be fortunate enough to find the right context to express their noblest aspirations. They should choose well. Leadership really means being of independent mind; not (just) private means. Jeremy Corbyn’s great contribution is that he does not speak with a forked tongue, and so long as that is so, he will remain an enormous moral asset because he will encourage and indeed, demand more open, genuine debate and affirmation of mutually reciprocal strength of purpose. The values that barren consumerism has so callously denigrated, are what used to be understood as the qualities of virtue, intelligence, integrity, truthfulness, honesty, generosity of spirit, wholesome imagination, loyalty, courage and so forth. Mr Corbyn reminds us that these essential human faculties still exist, and moreover that we forego them at our peril. He is not a salesman, he is a man of conscience; and in this era of gross neglect and abject irresponsibility, he reminds us that it is indeed possible to be a human being and still act professionally, without fear of the consequences. Determination is splendid, but without a heart, the strongest will in the world is nothing but an impotent imposter. Well, it could lead to a new call for an end to the madness, but it will be impotent to end the madness regardless of whether it is the official opposition or the party in power. Again, to reiterate something I’ve already written as a comment in response to the most recent Panitch interview: the “state” is not parliament but what parliament depends upon to execute its laws and policies. The “state,” where the real power of capitalist governance is vested, is the bureaucratic machinery itself, all of those government institutions designed so that the personnel on the lower rungs of its hierarchy obey those rungs above, and the key positions on the highest rungs, the people who sit at the apexes of these organizations, are beholden to the class interests of the uber rich because it is the uber rich themselves who either occupy these lofty heights of command and control or who select and carefully vet those who do. What, to take but one if extreme example, happened in Chile, under Salvador Allende’s radical left government? Sabotage from all sides from within the state apparatus itself for three years, until the bourgeois ‘generals’ decided that the time was finally ripe for its coup on behalf its class, that and the utter decimation of the working class movement. Of course, long before a coup might even be deemed a necessity by the ruling class, a parliamentary assembly could easily be paralyzed to the point of having to call a snap election in which it would loose — once those in the seats of real power, acting as one, managed to make life sufficiently intolerable for the majority while convincing them through an intense propaganda campaign that their woes were the direct result of the incompetence of their elected representatives. I think in this respect, the Trotskyites are mostly correct in their prognostications as to the most likely outcome of a reformist approach to ‘revolution.’ Unless the people who occupy all of the key bureaucratic positions in the state are somehow thrown overboard all at once, unless the principles of promotion to key decision making positions within state organizations are changed so that no one connected to ‘big money’ might be promoted into those positions, pretty much nothing changes. JC and his supporters will have to do more than make all the right calls if the madness of capitalism is to end. They may have to incite mutiny among the lower ranks of all state bureaucracies, especially among the security and military cadres. an impressively honest piece. The question is what the political strategic solution is. Thanks, folktruther. And very good question.